This group has become very popular recently as many parts of the world face increasing watering restrictions and declining gardening skills. Their interesting "architectural" forms work well with contemporary building design. 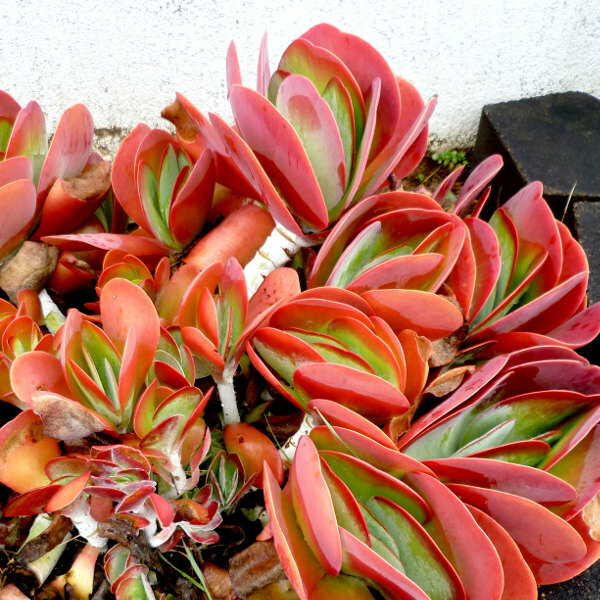 However, they could be very usefully incorporated into a more traditional garden if most of the succulents used are of the softer and prettier types and mixed in with other plants. Some bold types can be blended with drought tolerant palms, strelitzia and such for a waterwise tropical landscape. 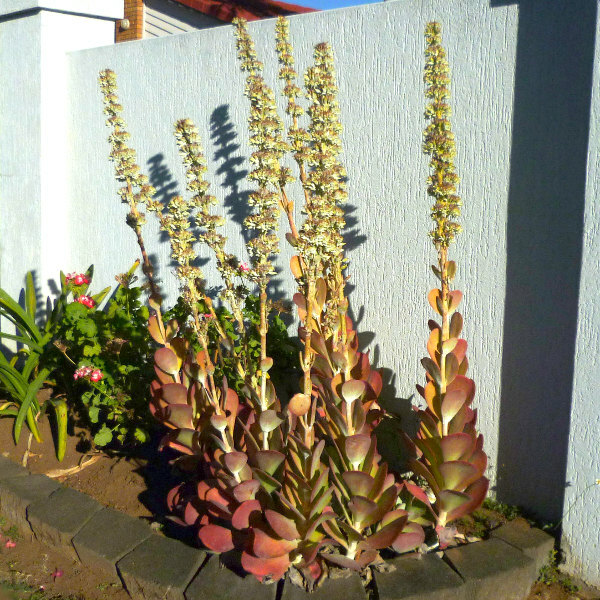 Succulents, with their fleshy leaves or stems, are an easily-recognised group of xeriphytes (or xerophytes) which are plants adapted to withstand prolonged periods with little water. 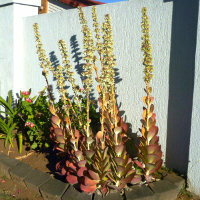 Most regular garden centres will probably carry an assortment of succulents. However, if you're looking for something in particular, especially if a rare species, you might need to seek out a specialist nursery or look out for succulents for sale at garden shows, open gardens etc. If you operate a succulent nursery (including online and mail order nurseries) or you promote or distribute unusual succulent plants or related products, please get in touch for information about advertising on this page. Euphorbia 'Diamond Frost' - This perennial flower/grtoundcover looks somewhat like a miniature snowflake (Euphorbia leucocephala) but flowers continuously. 'Diamond Frost' is the best known but there are other cultivars of a similar style coming into the marketplace. This genus encompasses a range of fleshy-leaved plants which are not spiky or spiny. Forms range from low growing to tall with leaves variously coloured and smooth or felt-like. 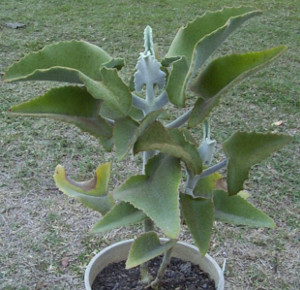 Kalanchoe beharensis and Kalanchoe beharensis (Propagation) National Council for the Conservation of Plants and Gardens, U.K.
Kalanchoe tomentosa National Council for the Conservation of Plants and Gardens, U.K.
Additional links about other species or about succulents in general are provided below. They are intended for general information, design ideas and research. Some plants referred to in links may be unavailable in Australia or even illegal to grow. Many heat and drought tolerant plants have considerable potential to become weeds (remember the prickly pear cactus! ), so take care. If in doubt, consult appropriate authorities in your region. Download: Angular pigface (Carpobrotus glaucescens) Factsheet download page Environmental Protection Agency, Queensland Govt. Cactus and Succulent Society of the ACT Inc.
Cactus and Succulent Society of New Zealand (CSSNZ) Inc.
Jardin Etnobotanico de Oaxaca at The Human Flower Project. Post about the The Ethnobotanical Garden of Oaxaca, Mexico. All Australians, especially anyone who grows or handles plants, should be aware of proposals from the federal government to expand the list of species to be banned or regulated due to alleged drug dangers. A variety of Australian natives and common garden exotics could potentially be banned, in addition to many cactus species. The website gardenfreedom.com provides more information on this issue, including how you can have your say.